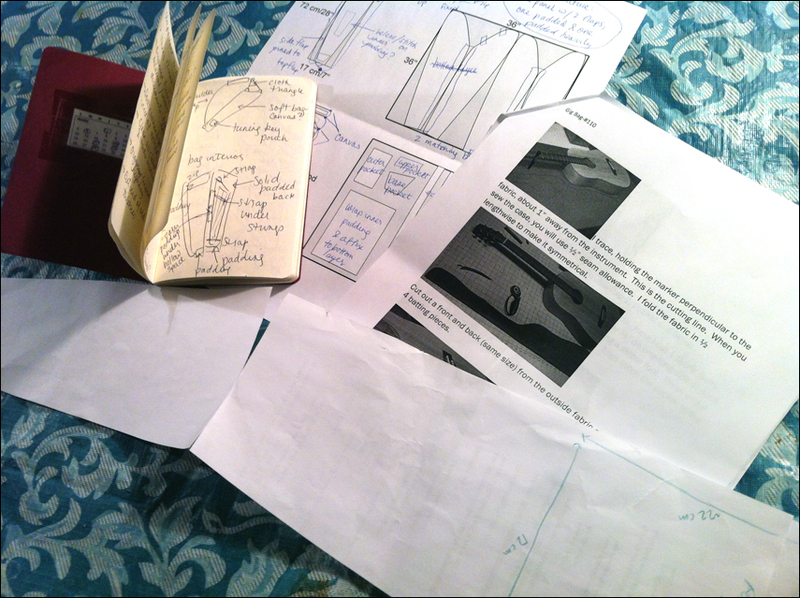 I am constantly surrounded by a variety of projects in different stages of completion. As much as I try to be conscientious about finishing them, I’m never certain which ones will make it all the way from idea to finished item and which ones never make it past a conceptual stage. The frenzied and involuntary planning mindset that strikes me with a brand new idea is always the same, but sadly, its priorities are often out of sync with what reason would recommend. A pile of scrapped plans. 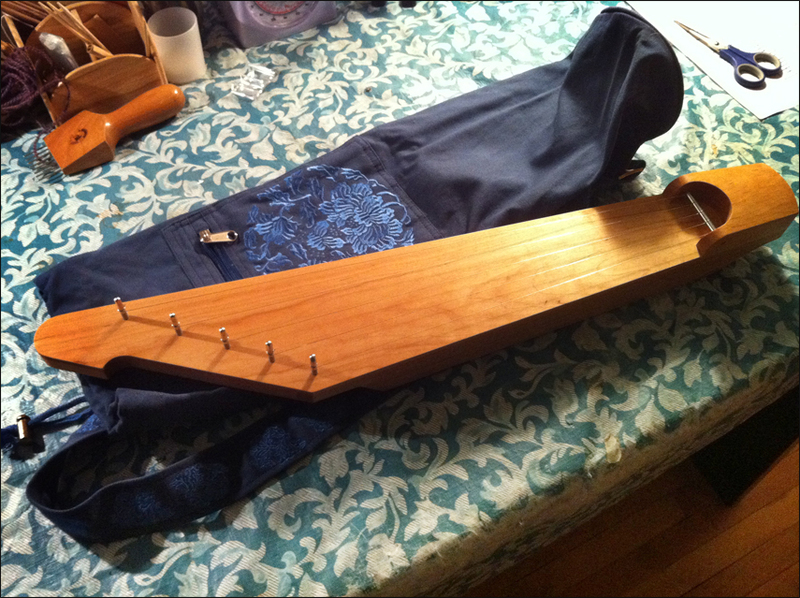 When I ordered my nice new kantele, I was planning to construct it a gig bag, a light case to carry it around. Although I had plans and a parts list, this is one of those ideas where time and budget actually made it more practical to purchase a pre-made bag. (For one, I don’t own a sewing machine.) As much as I enjoy creating my own things, I can’t make everything myself—otherwise I’d probably have built the harp, too. I console the yearnings of my creative soul by pointing out to it the appealing embroidery on the yoga bag. As far as my dreams of luthiery go, well… I have no consolation, although I did build a plywood lyre for a long-ago Latin class. Other projects get lost along the way, and find themselves mired in a state of potentially permanent incompletion. I find it a bit distressing to have these lying around my studio and usually find something to do with them, but there are a few that still sit waiting to be put to use. 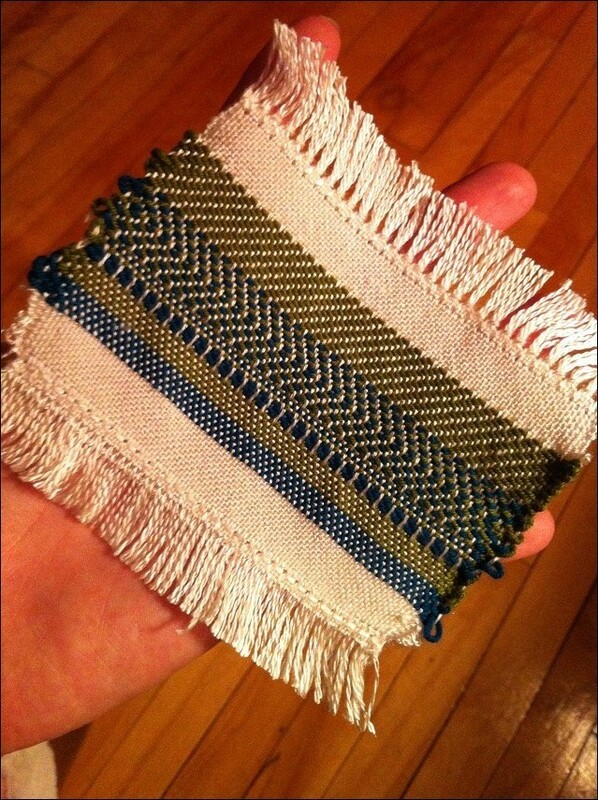 Short, flawed samples of tablet weaving come to mind. 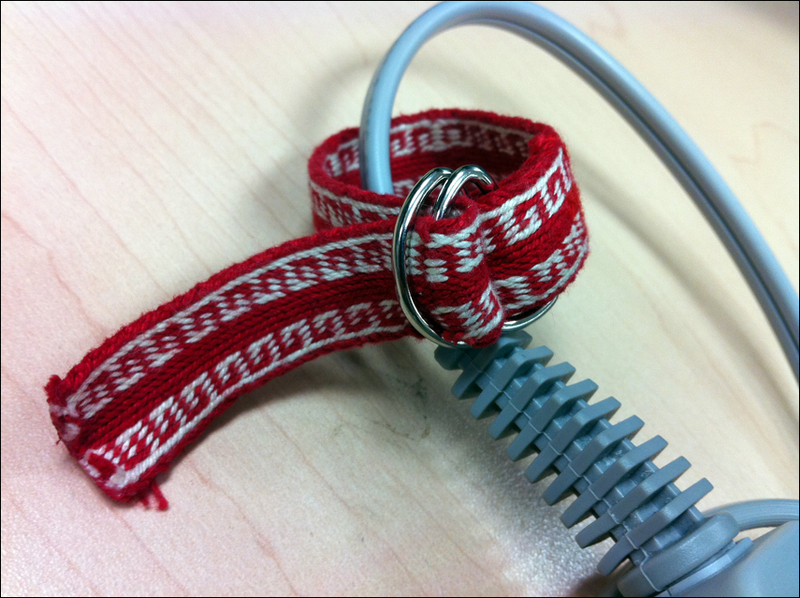 They do make wonderful cable ties! Another class of projects is that of the almost-finished. The failing here is in discipline more than in craftsmanship. My first rag rug. One day soon it will be hemmed. Honest! But there are indeed finished projects, with all of their various levels of success. I won’t lie: I liked this one. It’s satisfying to finish a project, but that’s not always why I make things. I love exploring ideas and testing hypotheses, improving my skills and learning as I go. Since the only deadlines and objectives of Crafting Time are my own, I’m able to follow a whim and see what happens. This occasionally means rebelling against the more organized part of my mind that grumbles and demands an orderly step-by-step approach. Sometimes it pays off, and sometimes it doesn’t. Thus, I’ve abandoned the long-awaited tambour project. Anyone who enjoys this sort of hobby has to be willing to let go of a non-starter. I suppose that in the abstract there’s no shame in letting go. Of course, it’s not really that easy to give up! So instead of cutting the project off the loom, or simply tossing my efforts in the samples bin, I took the warp in a new direction. Since we only had a few minutes for an impromptu lesson, I did the hemstitching and finishing, but the rest is chopsticknitter‘s excellent work. 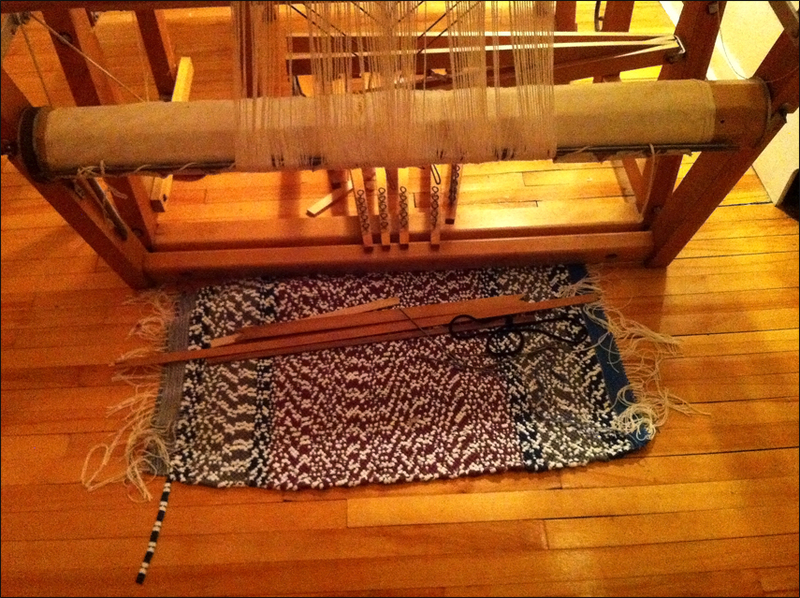 I taught someone to weave! At least a little bit. 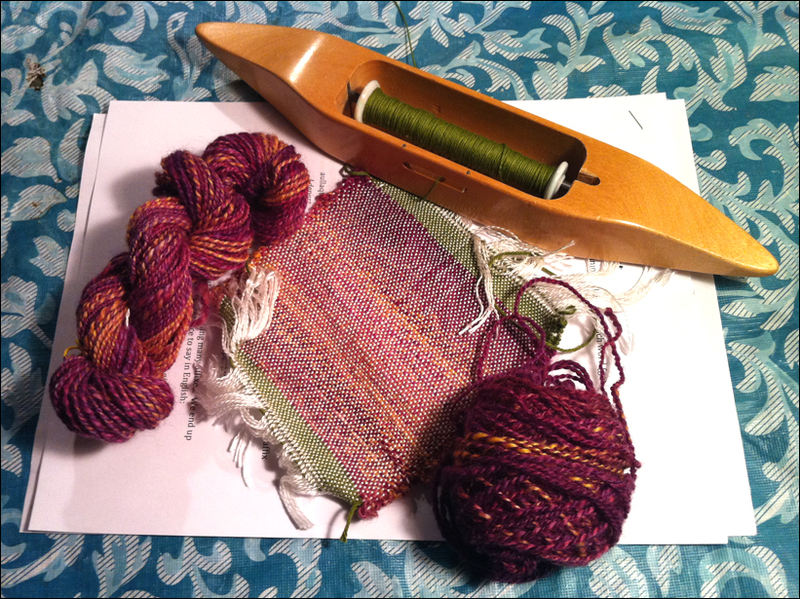 It was very very exciting, and my friend’s enthusiasm inspired me to make better use of the warp than simply stabbing at it glumly with an embroidery needle. After she left, I quickly wound some of my handspun onto a bobbin and threw it through a plain-weave shed, just to see what would happen. Nothing fancy. Actually pretty sloppy. 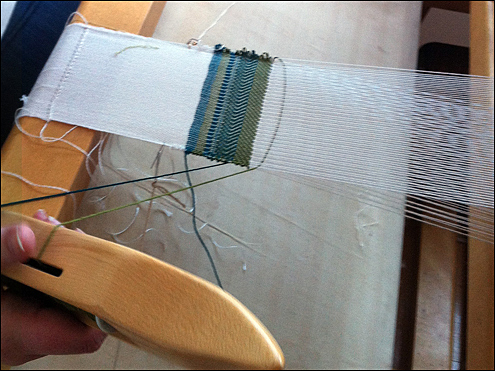 But I’ve decided to devote the rest of the warp to experimentation, and I’m back to my usual excitement about weaving. So I’ve learned two things: that teaching someone a craft you love is delightful, and that in certain circumstances, abandoning a project gives you the creative kick in the pants you need. I’ll let you know what comes of it all. Wonderful post! I too have a growing pile of abandoned projects that I always tell myself I will return to. One being a lovely (one hopes) beaded tree I had started making in Ottawa since I was craving a craft project and had left all my knitting back home. I keep telling myself one day I will return to all of them. But it’s nice to see a post about abandoned projects… it’s a phenomenon all hobbyist’s suffer methinks. Also btw, I love your new layout! Thanks! I decided it was time for an upgrade. How’s the crafting been going of late? 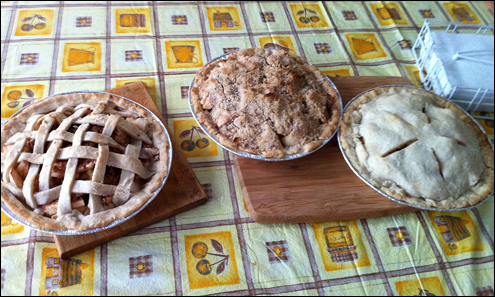 Don’t let me make any more for a while!